Our social responsibility encompasses the economic, legal, ethical and discretionary expectations that society has of us. Beside of profit maximization, our company did some social performances that benefit the community. In line with the environment protection activities of our government, we are promoting the consumers to use PP food container, instead of polystyrene. Our container and tumbler series are made of Food Grade Polypropylene (PP) plastic resin and recognized by ISO, high quality, safety use and environmental friendly. Following the 3R (Reduce, Reuse, Recycle) concept, all of our plastic products are recyclable. 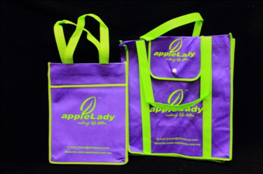 Besides, we reward our valued customers with Applelady recycle bags to encourage them reduce the usage of plastic bags. Sponsorships are given to the primary and secondary schools through the awarding of scholarships, and the replacement of furniture and fittings. To alert the young generation about the environment issue, most of the advertisements that we made are emphasizing on the impacts of using plastic containers and polystyrene container.